Last Saturday's WPA auction was packed to the gills with seemingly everyone who's anyone in the DMV art scene attending, including most of the area's top art collectors as well as some out of town familiar collectors' faces, including one good friend who also happens to be a prominent Cuban-American collector who calls Boston his home. "What are you doing here?" I asked surprised at seeing him at the auction. "I always fly in for this event," he replied. It appears to me that the auction itself was quite a success. I saw a lot of bids, which drawing from my memory banks, seemed to be more than usual. I am happy to report that my piece in the show, "Eve, Running Away from Eden," received so many bids that in fact it maxed out the bidding sheet and sold for 350% above the initial bidding estimate. Eve, Running Away from Eden. 15 x 39 inches. Charcoal on paper. The auction's artistic highlight was definitely when Dan Steinhilber and a small groups of helpers began assembling Steinhilber's piece for the auction, which he was going to construct right on site. The work, made up of a wood pallet and shrink wrap, began appearing before our eyes as the crew wrapped the pallet in shrink wrap of various colors. At one point I was sure that it was finished, as Steinhilber was initially using shrink wrap of various colors, and for a brief instant the pallet almost looked like a "back to the future" version of a Morris Louis painting! But the Steinhilber crew continued to add more shrink wrap and slowly the piece began to turn white, ending up as a handsome three dimensional white sculpture. Read the report from Daily Art Muse here. Last Friday, along with artists Tim Tate ( whose work just opened in the Milwaukee Art Museum's The New Materiality: Digital Dialogues at the Boundaries of Contemporary Craft two days go) and Susana Raab (whose work from her "Cholita" series will be in the Corridor exhibition at the Art Museum of the Americas opening March 24), we got together with four young artists whom we're mentoring as part of Strathmore's new visual arts mentorship program. I'll be discussing all four throughout the next few months, but let me start with the work of the very young Wilmer Wilson IV, from Chesterfield, Virginia, and currently a student at Howard University in Washington, DC. 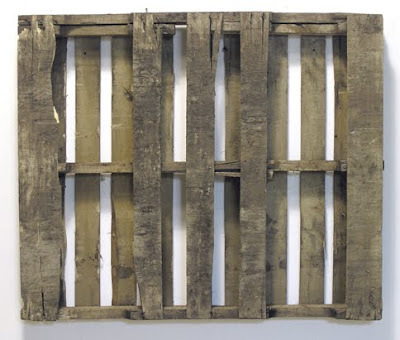 Before I start discussing his work, you start by viewing the below video of his installation titled Machine: Bad End. Wilson is very young, but already appears to possess an artistic vision well beyond his years, and at the present his work seems to fit into that genre of contemporary art which would label him as a WalMartist; that is, artists which use common, everyday materials (such as one would find in WalMart) to create elegant and intelligent artwork. In his installation titled "Bundles" (detail to the left, see the whole installation here), WIlson uses plastic forks and spoons to create an elegant and minimalist installation which uses the repetitive power of these two objects, together with black tape, which when attached to the wall transforms the objects into a energetic and planned modern bas relief of disposable design. 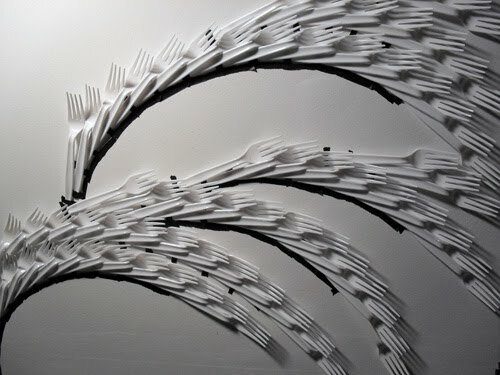 See more of these utensil installations here and check out his website here. Keep your eye on this artist.